"Every nation chooses alone whether to crash or not." Thus spoke Bulgaria's former Prime Minister Boyko Borisov right before the early elections last Sunday. 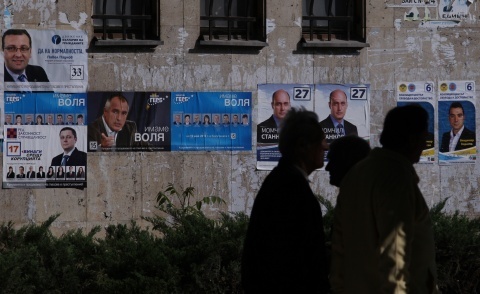 The elections were a defining moment in Bulgaria’s history. With many despairing, dissatisfaction with the political class ran high, while the animosity among parties as intense as back in the 90s. Segregated into those “above” and those “below”, Bulgarians had to make a stark choice about what comes next. They could decide to go for more of the same and put their (obviously blind) faith again in former Prime Minister Borisov, who was forced to resign in February by mass protests; bank on the old crooks from the previous government; throw common sense to the wind and vote for the ethnic Turks/the nationalists or give former European Commissioner Meglena Kuneva and some of the smaller parties another chance to give the country an EU facelift. Half of the voters went for all of the above options, except the last one. The other half simply refused to go to the polls, leaving the outcome of the elections in the hands of pensioners, Roma people, manipulated voters and the formidable electoral machine of the ethnic Turks. But voters’ apathy is understandable – people are disgusted by the political elite. Unfortunately, the only conclusive result of the early elections is that their aftermath turned into a challenge even for Bulgarians' proverbially high level of tolerance to nausea. Even more so after the former ruling GERB party, which won a slight lead in the elections, demanded on Thursday a rerun of Sunday's election, blaming illegal campaigning for its failure to win more support. Fully aware his proposal for a minority government is most likely doomed and desperately trying to prolong uncertainty and the term of the caretaker government, former Prime Minister Boyko Borisov in fact is setting the stage for his own public humiliation. True, for the first time in Bulgaria’s new history a party has won two consecutive elections. But also for the first time, a party has won with such a few number of votes, just about a million. Prior to May 12 elections, it was all about whether the ousted prime minister will become a former prime minister for the next four years at least. After the elections, the question is how unstable the ushered in coalition will be. The bickering political forces did their best to bring the people's confidence to its lowest. And few harbor hopes that new government will solve the most acute problems plaguing the country - corruption, rising prices, unemployment. A delayed and very unstable government would be a poisonous combination for the country, increasing the likelihood of prolonged political stalemates, stalled decision making, rising unemployment and stagnating wages. First, the chaotic aftermath of the elections and the failure of the political elite to put the house in order immediately shook Bulgarians out of their inertia. Last but not least, omerta, the code of silence, was broken and for the first time since quite a while parties’ struggle for power is real.